Today, we will be discussing about help content, specifically where we can get help and what content is available. The different types of help content that are available in studio are Integrated and Local. Now what is integrated help? Installed automatically when you install the studio. How to get Integrated Help Content? 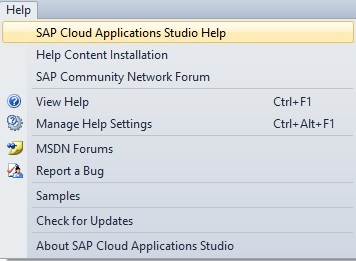 Go to the Help menu and then choose SAP Cloud Applications Studio Help in studio. This is going to open an online help page in browser. So it’s a help content that’s already available in online, it’s always real time-updated, so that you do not need to do anything extra to use this Integrated help. It contains Getting started, what’s New, Scripting language, business logic and so on. 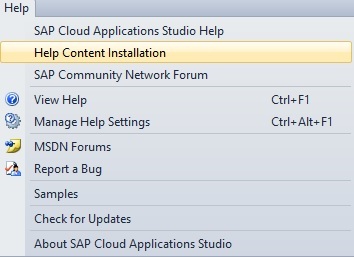 If you have any issues downloading SDK, you can get help from CloudSolutionPartner@sap.com. This is also the same exact content, just a different way that we’re going to access it. Content installed automatically when you install the studio. Can easily search all studio help content. Updated automatically when updating your studio build. How to get Local Help Content? The local help content can be found under Help -> Help Content Installation in studio, it will help you to install the actual Viewer, and then you’ll have it available to you to view directly on your machine, so that’s local, it’s not online but still the same content as it is in the Integrate Help Content. What is the main different Between Local and Integrated help content? Search: The integrated help content online, you can’t search directly for anything. But with the local help content, you can search. So if you want to know elements specifically for a business object, you can search for “element” and it’ll help navigate you to the right place. Context-sensitive F1 help: Local help content gives context-sensitive F1 help. If you need any information on an element while you declare it just click on the root element, then press F1, and it’s going to load the help content directly for the element you have declared. For more information, go to Help->Help content Installation in studio. Help content for all releases can be found online at help.sap.com. 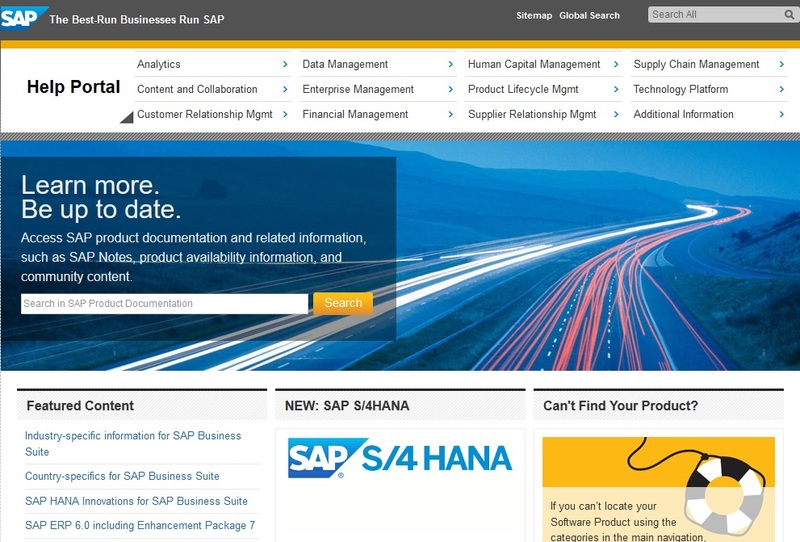 Select Technology platform-> SAP Cloud Application Studio. 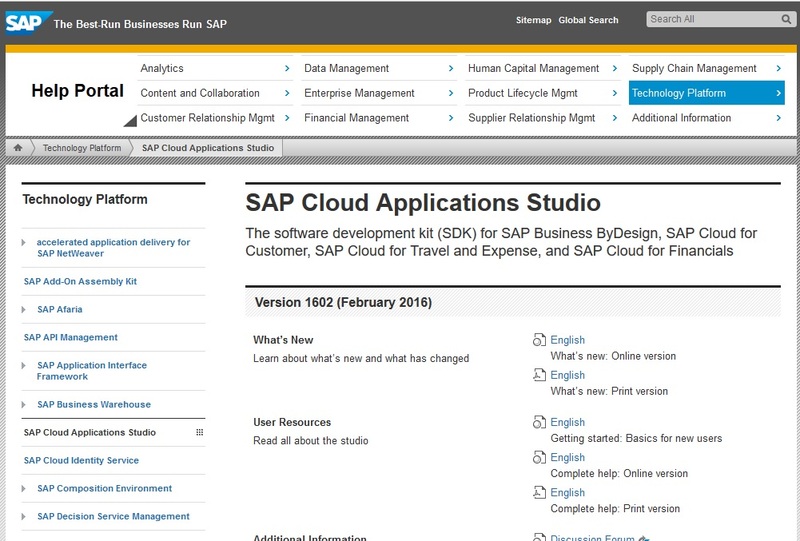 It contains all the previous versions of SAP Cloud Application studio. In each version we can specifically see a “What’s new” section, the user resources – the majority of the help. The combination of above all features gives an online version, which is also a type of integrated help content. All these contents are available in online as well as pdf version i.e., you can read it via both online and offline. Here you can ask questions, look at blog posts, there’s lots of ‘HowTo’ videos that people have posted for some of the different things that you can do in the studio. It’s a very good resource that’s available to you. So it’s a very great resource for looking at different things and getting feedback, bouncing ideas off of other developers, very helpful. 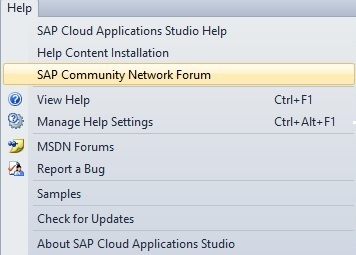 You can access it either from the link or, go to Help -> SAP Community Network Forum in SDK, which is redirect to SCN. 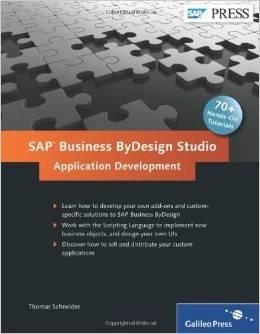 This is a most important book that was published a few years ago called SAP Business ByDesign Studio. This has not been updated in a little bit, but it is a very good book! It talks in great detail about the basics of the studio. And it can be really helpful in understanding, a lot of the deeper understanding in the studio, really why certain things are built, and how really relates to building the different content, and how they relate with each other. So it’s a great book, it’s available on Amazon, the link’s available here. No matter whether you use the Integrated or local help either of the one is enough to give you details on any functionality that is within the studio. And then you can always go on the SCN page to look for more, expert advice or feedback from other people. And then the book, will give you lots of real content. In the next article, we’ll be looking at different types of solutions and getting ourselves set up to do actually do some real development.